Packaged Facts, a useful site for keeping track of demographic and economic trends, just published an analysis of US Census figures that concludes singles now head the largest number of American households. For years demographers have documented the declining size of the US household and the rising number of total American households. Now we find that the single person is the majority. The Mode Shift point is that the place that more singles are choosing to call home also happens to be America’s urban areas, according to US Census figures. Central city neighborhoods are gaining population for the first time since the 1940 and 1950s. 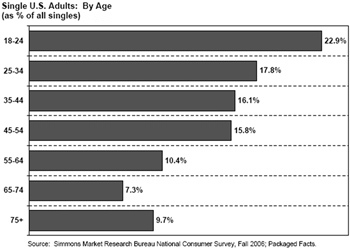 Singles seek cities for a number of obvious reasons — jobs, entertainment, social networking, tribalism. Still, my own reporting from various metropolitan regions across the country in recent months — Knoxville, Salt Lake City, Seattle, New York, Washington, Chicago, Detroit, and Grand Rapids — indicates that single people — young, middle age, and seniors — also are motivated by time and expenses. They’re finding it less expensive and more efficient to live in cities where housing costs may be higher, but those costs are offset by much lower transportation expenses — less driving. They also have more time because the places in their lives are closer, and many feel safer now in the city than they do in suburbs that can be very isolating. The effect of this demographic trend, coupled with rising energy and land costs and static incomes, is having profound effects on housing choices and development patterns. These are becoming more apparent to builders and planners. Dwellings, enormous now, will start to become smaller, closer together, and closer to metropolitan centers. Salt Lake City is a good example. Townhomes and apartments built close to the region’s rapid transit line are selling out even before they are built. Many buyers are single. The homes are priced and sized right — $200,000 for 1,400 square feet — and located near the center of things.